When it comes to naming colors, most people do so with ease. But, for odors, it's much harder to find the words. One notable exception to this rule is found among the Jahai people, a group of hunter-gatherers living in the Malay Peninsula. An earlier study showed that, for them, odors are just as easy to name as colors. Now a new study reported in Current Biology on January 18 suggests that the Jahai's special way with smell is related to their hunting and gathering lifestyle. "There has been a long-standing consensus that 'smell is the mute sense, the one without words,' and decades of research with English-speaking participants seemed to confirm this," says Asifa Majid of Radboud University in the Netherlands. "But, the Jahai of the Malay Peninsula are much better at naming odors than their English-speaking peers. This, of course, raises the question of where this difference originates." To find out whether it was the Jahai who have an unusually keen ability with odors or whether English speakers are simply lacking, Majid and Nicole Kruspe at Lund University in Sweden looked to two related, but previously unstudied, groups of people in the tropical rainforest of the Malay Peninsula: the hunter-gatherer Semaq Beri and the non-hunter-gatherer Semelai. The Semelai are traditionally horticulturalists, combining shifting rice cultivation with the collection of forest products for trade. 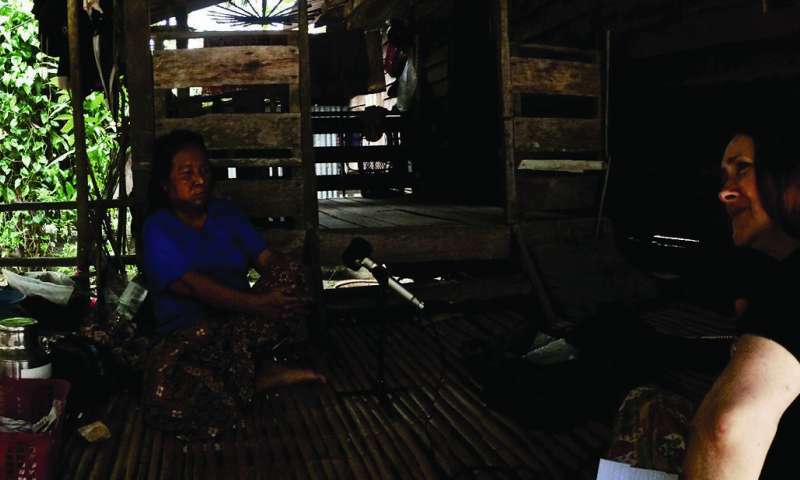 The Semaq Beri and Semelai not only live in a similar environment; they also speak closely related languages. The question was: how were they at naming odors? "If ease of olfactory naming is related to cultural practices, then we would expect the Semaq Beri to behave like the Jahai and name odors as easily as they do colors, whereas the Semelai should pattern differently," the researchers wrote. And, that's exactly what they found. Majid and Kruspe tested the color- and odor-naming abilities of 20 Semaq Beri and 21 Semelai people. Sixteen odors were used: orange, leather, cinnamon, peppermint, banana, lemon, licorice, turpentine, garlic, coffee, apple, clove, pineapple, rose, anise, and fish. For the color task, study participants saw 80 Munsell color chips, sampling 20 equally spaced hues at four degrees of brightness. Kruspe tested participants in their native language by simply asking, "What smell is this?" or "What color is this?" The results were clear. The hunter-gatherer Semaq Beri performed on those tests just like the hunter-gatherer Jahai, naming odors and colors with equal ease. The non-hunter-gatherer Semelai, on the other hand, performed like English speakers. For them, odors were difficult to name. The results suggest that the downgrading in importance of smells relative to other sensory inputs is a recent consequence of cultural adaption, the researchers say. "Hunter-gatherers' olfaction is superior, while settled peoples' olfactory cognition is diminished," Majid says. They say the findings challenge the notion that differences in neuroarchitecture alone underlie differences in olfaction, suggesting instead that cultural variation may play a more prominent role. They also raise a number of interesting questions: "Do hunter-gatherers in other parts of the world also show the same boost to olfactory naming?" Majid asks. "Are other aspects of olfactory cognition also superior in hunter-gatherers," for example, the ability to differentiate one odor from another? "Finally, how do these cultural differences interact with the biological infrastructure for smell?" She says it will be important to learn whether these groups of people show underlying genetic differences related to the sense of smell.